In this study, the relationship among airline service quality, perceived value, brand image and customer satisfaction variables was investigated. For this purpose it was collected survey data from 746 individuals who purchased airline services in Gaziantep. The obtained data were analysed by the structural equation modelling. As a result of the analysis, it has been found that the quality of airline service significantly affects customer satisfaction, brand image and perceived value positively. It has been determined that perceived value and brand image significantly affect customer satisfaction positively. In addition, airline service quality, customer satisfaction, brand image and perceived value differ significantly in favour of the public sector when compared to public sector. ﻿ Bu çalışmada havayolu hizmet kalitesinin algılanan değer, marka imajı ve müşteri memnuniyeti arasındaki ilişki araştırılmıştır. Bu amaçla Gaziantep ilinden havayolu hizmeti alan 746 kişiden anket ile veri toplanmıştır. Elde edilen veriler yapısal eşitlik modeli ile analiz edilmiştir. Analiz neticesinde havayolu hizmet kalitesinin müşteri memnuniyetini, marka imajını ve algılanan değeri pozitif yönde anlamlı olarak etkilediği bulgusuna ulaşılmıştır. Algılanan değer ve marka imajının da müşteri memnuniyetini pozitif yönde anlamlı olarak etkilediği tespit edilmiştir. Ayrıca havayolu hizmet kalitesi, müşteri memnuniyeti, marka imajı ve algılanan değerin kamu sektörü ve özel sektör arasında kamu sektörü lehine anlamlı farklılık gösterdiği sonucuna varılmıştır. ALI, F., Dey, B. L. ve Filieri, R. (2015). An assessment of service quality and resulting customer satisfaction in Pakistan International Airlines: Findings from foreigners and overseas Pakistani customers. International Journal of Quality & Reliability Management, 32(5), 486–502. AmIN, M., Isa, Z. ve Fontaine, R. (2013). Islamic banks: Contrasting the drivers of customer satisfaction on image, trust, and loyalty of Muslim and non-Muslim customers in Malaysia. International Journal of Bank Marketing, 31(2), 79–97. ANDERSON, E. W., Fornell, C. ve Lehmann, D. R. (1994). Customer satisfaction, market share, and profitability: Findings from Sweden. The Journal of marketing, 53–66. ARCHANA, R. ve Subha, M. V. (2012). A study on service quality and passenger satisfaction on Indian airlines. International Journal of Multidisciplinary Research, 2(2), 50–63. BUBALO, B. ve Gaggero, A. A. (2015). Low-cost carrier competition and airline service quality in Europe. Transport Policy, 43, 23–31. CHEN, C.-F. ve Tsai, M.-H. (2008). Perceived value, satisfaction, and loyalty of TV travel product shopping: Involvement as a moderator. Tourism management, 29(6), 1166–1171. CHEN, I.-S. (2016). A combined MCDM model based on DEMA℡ and ANP for the selection of airline service quality improvement criteria: a study based on the Taiwanese airline industry. Journal of Air Transport Management, 57, 7–18. CHOU, C.-C., Liu, L.-J., Huang, S.-F., Yih, J.-M. ve Han, T.-C. (2011). An evaluation of airline service quality using the fuzzy weighted SERVQUAL method. Applied Soft Computing, 11(2), 2117–2128. DAVIES, G. ve Chun, R. (2002). Gaps between the internal and external perceptions of the corporate brand. Corporate Reputation Review, 5(2-3), 144–158. DAVIES, G., Chun, R., Da-Silva, R. & Roper, S. (2003). Corporate Reputation and Competitiveness. Routledge, UK: London. DE JAGER, J. W., Van Zyl, D. ve Toriola, A. L. (2012). Airline service quality in South Africa and Italy. Journal of Air Transport Management, 25, 19–21. DENG Z., Lu, Y., Wei, K. K. ve Zhang, J. (2010). Understanding customer satisfaction and loyalty: An empirical study of mobile instant messages in China. International journal of information management, 30(4), 289–300. FAIRCHLOTHE, J. B., Capella, L. M. ve Alford, B. L. (2001). The effect of brand attitude and brand image on brand equity. Journal of Marketing Theory and Practice, 9(3), 61–75. FAROOQ, M. S., Salam, M., Fayolle, A., Jaafar, N. ve Ayupp, K. (2018). Impact of service quality on customer satisfaction in Malaysia airlines: A PLS-SEM approach. Journal of Air Transport Management, 67, 169–180. FAULLANT, R., Matzler, K. ve Füller, J. (2008). The impact of satisfaction and image on loyalty: the case of Alpine ski resorts. Managing Service Quality: An International Journal, 18(2), 163–178. FORNELL, C., Johnson, M. D., Anderson, E. W., Cha, J. ve Bryant, B. E. (1996). The American customer satisfaction index: nature, purpose, and findings. the Journal of Marketing, 7–18. GOURDIN, K. N. (1988). Bringing quality back to commercial air travel. Transportation Journal, 23–29. GRONROOS, C. (1984). A service quality model and its marketing implications, European Journal of Marketing, Vol. 18 No. 4, pp. 36-44. GRONROOS, C. (2000). Service Management and Marketing: A Customer Relationship Management Approach, 2nd ed., John Wiley & Sons, England. GURSOY, D., Chen, M.-H. ve Kim, H. J. (2005). The US airlines relative positioning based on attributes of service quality. Tourism management, 26(1), 57–67. HAPSARI, R., Clemes, M. D. ve Dean, D. (2017). The impact of service quality, customer engagement and selected marketing constructs on airline passenger loyalty. International Journal of Quality and Service Sciences, 9(1), 21–40. HSIEH, M.-H., Pan, S.-L. ve Setiono, R. (2004). Product-, corporate-, and country-image dimensions and purchase behavior: A multicountry analysis. Journal of the Academy of Marketing Science, 32(3), 251–270. HU, H.-H., Kandampully, J. ve Juwaheer, T. D. (2009). Relationships and impacts of service quality, perceived value, customer satisfaction, and image: an empirical study. The service industries journal, 29(2), 111–125. HUSSAIN, R. (2016). The mediating role of customer satisfaction: evidence from the airline industry. Asia Pacific Journal of Marketing and Logistics, 28(2), 234–255. HUSSAIN, R., Al Nasser, A. ve Hussain, Y. K. (2015). Service quality and customer satisfaction of a UAE-based airline: An empirical investigation. Journal of Air Transport Management, 42, 167–175. KIM, M.K., Park, M.-C. ve Jeong, D.-H. (2004). The effects of customer satisfaction and switching barrier on customer loyalty in Korean mobile telecommunication services. Telecommunications policy, 28(2), 145–159. KOUBAA, Y. (2008). Country of origin, brand image perception, and brand image structure. Asia Pacific Journal of Marketing and Logistics, 20(2), 139–155. KUMAR, V. ve Shah, D. (2004). Building and sustaining profitable customer loyalty for the 21st century. Journal of retailing, 80(4), 317–329. KUO, Y.F., Wu, C.-M. ve Deng, W.-J. (2009). The relationships among service quality, perceived value, customer satisfaction, and post-purchase intention in mobile value-added services. Computers in human behavior, 25(4), 887–896. LIOU, J. J., Hsu, C.-C., Yeh, W.-C. ve Lin, R.-H. (2011). Using a modified grey relation method for improving airline service quality. Tourism Management, 32(6), 1381–1388. LIOU, J. J. ve Tzeng, G.-H. (2007). A non-additive model for evaluating airline service quality. Journal of Air Transport Management, 13(3), 131–138. NAMUKASA, J. (2013). The influence of airline service quality on passenger satisfaction and loyalty: The case of Uganda airline industry. The TQM Journal, 25(5), 520–532. OSTROWSKI, P. L., O’Brien, T. V. ve Gordon, G. L. (1993). Service quality and customer loyalty in the commercial airline industry. Journal of travel research, 32(2), 16–24. PARK, J.-W., Robertson, R. ve Wu, C.-L. (2006). Modelling the impact of airline service quality and marketing variables on passengers’ future behavioural intentions. Transportation Planning and Technology, 29(5), 359–381. RHOADES, D. L. ve Waguespack Jr, B. (2005). Strategic imperatives and the pursuit of quality in the US airline industry. Managing Service Quality: An International Journal, 15(4), 344–356. ROTH, M. S. (1995). The effects of culture and socioeconomics on the performance of global brand image strategies. Journal of Marketing Research, 163–175. SAHA, G. C. ve Theingi. (2009). Service quality, satisfaction, and behavioural intentions: A study of low-cost airline carriers in Thailand. Managing Service Quality: An International Journal, 19(3), 350–372. SALEEM, H. ve Raja, N. S. (2014). The impact of service quality on customer satisfaction, customer loyalty and brand image: Evidence from hotel industry of Pakistan. 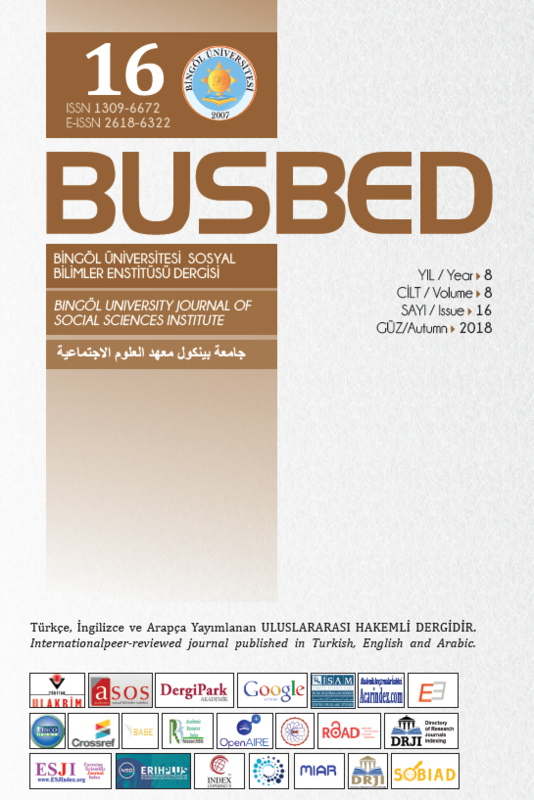 Middle-East Journal of Scientific Research, 19(5), 706–711. SINGH, A. K. (2015). Modeling passengers’ future behavioral intentions in airline industry using SEM. Journal of Advances in Management Research, 12(2), 107–127. SINGH, A. K. (2016). Competitive service quality benchmarking in airline industry using AHP. Benchmarking: An International Journal, 23(4), 768–791. SONDOH Jr, S. L., Omar, M. W., Wahid, N. A., Ismail, I. ve Harun, A. (2007). The effect of brand image on overall satisfaction and loyalty intention in the context of color cosmetic. Asian Academy of Management Journal, 12(1), 83–107. SUKI, N. M. (2014). Passenger satisfaction with airline service quality in Malaysia: A structural equation modeling approach. Research in transportation business & management, 10, 26–32. SUM VHAU, V. ve Kao, Y.-Y. (2009). Bridge over troubled water or long and winding road? Gap-5 in airline service quality performance measures. Managing Service Quality: An International Journal, 19(1), 106–134. SWEENEY, J. C. ve Soutar, G. N. (2001). Consumer perceived value: The development of a multiple item scale. Journal of retailing, 77(2), 203–220. TAM, J. L. (2004). Customer satisfaction, service quality and perceived value: an integrative model. Journal of marketing management, 20(7-8), 897–917. TARN, J. L. (1999). The effects of service quality, perceived value and customer satisfaction on behavioral intentions. Journal of Hospitality & Leisure Marketing, 6(4), 31–43. TIERNAN, S., Rhoades, D. L. ve Waguespack Jr, B. (2008). Airline service quality: Exploratory analysis of consumer perceptions and operational performance in the USA and EU. Managing Service Quality: An International Journal, 18(3), 212–224. TRUITT, L. J. ve Haynes, R. (1994). Evaluating service quality and productivity in the regional airline industry. Transportation Journal, 21–32. TU, Y.T., Wang, C.-M. ve Chang, H.-C. (2012). Corporate brand image and customer satisfaction on loyalty: An empirical study of Starbucks coffee in Taiwan. Journal of Social and Development Sciences, 3(1), 24–32. YANG, Z. ve Peterson, R. T. (2004). Customer perceived value, satisfaction, and loyalty: The role of switching costs. Psychology & Marketing, 21(10), 799–822. YI, Y. ve La, S. (2004). What influences the relationship between customer satisfaction and repurchase intention? Investigating the effects of adjusted expectations and customer loyalty. Psychology & Marketing, 21(5), 351–373.